Today is the holiday extravaganza edition of Flannel Friday! To celebrate, I have not one, but TWO ideas to share (and one of them is not a flannelboard.) Also, I’m off today and working on these at home, so instead of seeing my library’s activity room and flannelboard, you’ll be seeing my apartment and carpet. Let’s get started! 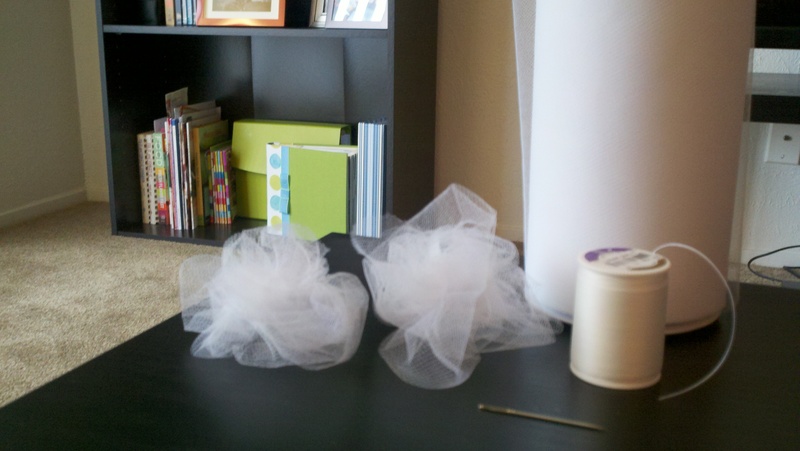 Idea #1: Indoor Snowballs Made of Tulle! I know not everyone gets a white Christmas (Texas included), but I just can’t help myself. When I think of Christmas, I think of snow! To make these babies, I cut off a decent amount of tulle, thread a needle, then bunch the tulle up into a ball and pull the needle and thread through a few times so that it keeps its ball shape. It takes less than a minute to make one snowball, though I’ll be needing lots and lots of snowballs for what I’m planning to do, so I’ll probably still be working on this for an hour or so. My plan with these is to dump the snowballs onto the floor and play the song ‘Frosty the Snowman’ while the kids are playing in the snow. I’ll stop the song at intervals, and whenever the music stops, the kids will have to freeze! It’ll be a great stop and go game. Of course I’ll have to explain some rules, such as you can only pick up one or two snow balls at a time (to keep kids from hording all the snowballs) and if you throw snowballs in a snowball fight, you can’t throw at anyone’s head. The word ‘Santa’ has the perfect amount of letters for the BINGO song, but I already did that with ‘apple’ a few months ago. So then I thought, “What about a simplified version of the BINGO game?” So that’s how I thought of this one. I found 25 holiday clip art pictures in Microsoft Word and printed them out twice. One set has Velcro on the back so that they can form our BINGO board on the flannelboad. The others will go into a bag, and I’ll go around the room and have each child reach into the bag and pull out one picture. He or she will then need to find the matching picture on the board, and when they do, I’ll take that picture down and replace it with a Santa hat BINGO marker. Depending on how many kids will be there, we’ll either play until we have BINGO, or we’ll play until the whole board is filled with Santa hats. At the end, everyone will be a winner and I’ll hand out small prizes, such as candy or a pencil. The holiday extravaganza Flannel Friday is being hosted by the lovely Loons and Quines! And be sure to check out the Flannel Friday Pinterest as well as the Flannel Friday Facebook page! What great ideas for games! I’m going to make your snowballs for definite – not for a snowball fight, but to put on our mini parachute (that parachute hasn’t seen the light of day for a while)! Using the indoor snowballs on a mini parachute is a great idea! I was going to suggest a parachute too. Also, styrofoam balls work good on a parachute as snowballs too. You can get them cheap at the Dollar store. Styrofoam balls would also be less time consuming! If my library ever gets a mini parachute, I will definitely keep that in mind! Thank you so much! Indoor snowballs – love it! Love your bingo game. 🙂 We do a Family Game Night following our evening storytime once a month. This month I read “Mouse’s First Christmas” and then we played a simple version of bingo that I call “Three in a Row”. The pictures and clues were based on the Mouse book. It was fun! 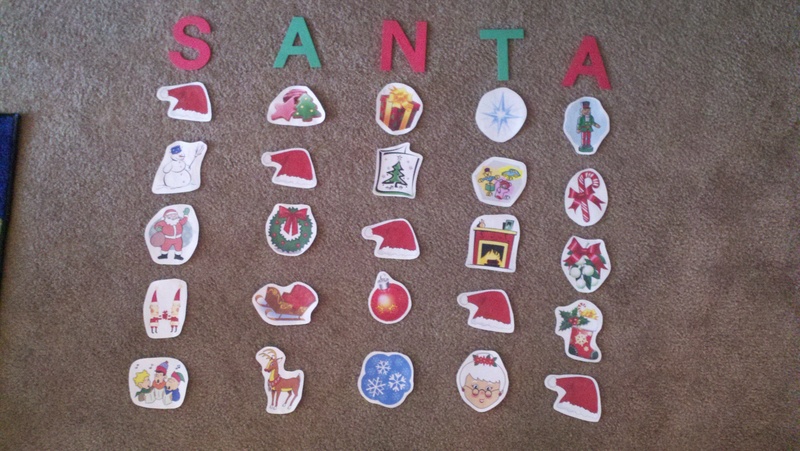 I think my families who will be attending our annual Snack with Santa would really enjoy your version of bingo. I like the way you played it with the children pulling the item out of the bag. Cute idea! Great way to encourage audience participation! I ❤ audience participation activities! Thank you! The “Three in a Row” game sounds like fun! Do you mind sharing how it’s played? OOO, have you ever read Snowball Fight! by Jimmy Fallon (yes, that Jimmy Fallon) It’s actually a great book to read if you’re planning a “snowball” fight storytime activity. I haven’t read it! I’ll have to see if my library has it so I can include it in storytime. Thanks for the suggestion! I wanted to let you know about our ‘so called’ mini parachute. It is actually a large square of glittery Lycra fabric (6 feet square). It’s great for small groups and babies, and as we only have a small space to hold storytimes, it works better for us than a large ‘cute (plus a remnant of fabric is very cost-effective). The Santa bingo is brilliant! Love your snowballs and coincidentally came across a spool of tulle left over from my wedding so I made a trial snowball. You’re right; the sewing doesn’t take too long but making a knot big enough that it wouldn’t pull through the tulle took a while. Is there a faster way to do that or do I just have to tie a big knot every time I start a new one? Thanks! Such a cute idea! I’m glad you like them! As for the knots, I just make a double knot. If there’s an easier way to do it, I haven’t figured it out yet.